Main items offered by the tourist center include admiring the marvellous spectacle of Furong cave, drifting on the Furong River, climbing Xiannu Mountain, and viewing the landscape of the gorges on the Wujiang River. Drifting on the Furong River It can be divided into drifting for, ordinary recreation (the section on the Zhuzi stream below Sanhekou) and for excitement (the section on the Pangu River). There are three points to start the excitement drifting from Shanmen Gorge, Miaozhai, or Liansan Shora. The most exciting is to start from Lianshan Shoa. The 1,800-meter journey, the golden section of drifting on the Furong River, passes 26 shoals. Located at the confluence of the Wujiang and Furong rivers in the town of Jiangkou, Wulong county, it is a large limestone cavern, 2,400m long and 30-50 meters high and wide. The Huihuang (brilliant) Hall has a floor space of 11,000 sq meters. The cave features a wide distribution of pure stalactites of every form, offering visitors and artistic treat to nature's marvellousness. 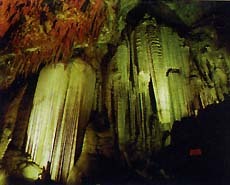 Furong Cave has been cited as an "ndergroud museum in China."